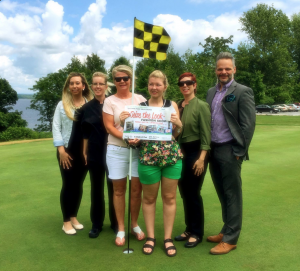 I had the pleasure of meeting a few of the key members of the Seize the Look Fashion Show team and visit Sand Point Golf Course in Arnprior. What a beautiful location – rolling green hills surrounded by trees with a view of the lake. Thank you to Tracy Whyte-Reid, Lauren, Sand Point Golf Course, and the rest of the team who put on the Seize the Look Fashion Show! They raised $3,000 to support people with epilepsy while also promoting local Arnprior businesses and featuring models living with seizures. Find out how to organize your own fundraiser for Epilepsy Ottawa on our Create Your Own Fundraiser page.